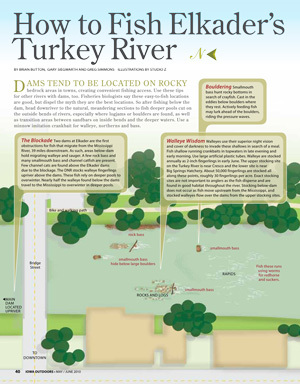 Dams tend to be located on rocky bedrock areas in towns, creating convenient fishing access. Use these tips for other rivers with dams, too. Fisheries biologists say these easy-to-fish locations are good, but dispel the myth they are the best locations. So after fishing below the dam, head downriver to the natural, meandering sections to fish deeper pools cut on the outside bends of rivers, especially where logjams or boulders are found, as well as transition areas between sandbars on inside bends and the deeper waters. Use a minnow imitation crankbait for walleye, northerns and bass. Smallmouth bass hunt rocky bottoms in search of crayfish. cast in the eddies below boulders where they rest. actively feeding fish may lurk ahead of the boulders, riding the pressure waves. Two dams at Elkader are the first obstructions for fish that migrate from the Mississippi River, 39 miles downstream. as such, areas below-dam hold migrating walleye and sauger. A few rock bass and many smallmouth bass and channel catfish are present. Few channel cats are found above the Elkader dams due to the blockage. The DNR stocks walleye fingerlings upriver above the dams. ¨These fish rely on deeper pools to overwinter. Nearly half the walleye found below the dams travel to the Mississippi to overwinter in deeper pools. Walleyes use their superior night vision and cover of darkness to invade these shallows in search of a meal. Fish shallow, running crankbaits in topwaters in late evening and early morning. Use large artificial plastic tubes. Walleye are stocked annually as 2-inch fingerlings in early June. The upper stocking site on the Turkey River is near Cresco and the lower site is near Big Springs Hatchery. About 50,000 fingerlings are stocked all along these points, roughly 30 fingerlings per acre. Exact stocking sites are not important to anglers as the fish disperse and are found in good habitat throughout the river. Stocking below-dam does not occur as fish move upstream from the Mississippi, and stocked walleyes flow over the dams from the upper stocking sites. Based on a DNR tracking study of radio-tagged fish below Elkader, all channel catfish, 64 percent of walleye and 60 percent of smallmouth bass implanted with radio transmitters move to the Mississippi River in search of deeper water to overwinter. Movement begins late October or early November when water temperatures drop below 50˚ F. Channel cats overwinter in holes 20-feet deep; walleye and smallmouth in less deep areas. These fish move back to the Turkey River in early April when water temperatures are near 44̊ F. Water depths greater than 15 feet were only found in two places in the 39 mile run from Elkader to the Mississippi, with both spots within two miles of the Mississippi River. Obstacles to fish migration, such as dams, are good fishing locations to target many species all year except winter, when fish seek deeper holes. Migratory fish stack up below dams as far away as a mile in deeper resting pools, so don’t limit fishing to just below dams. Northern Pike will dart the fast water at dams, attempting to migrate upriver right after ice-out. Use large, flashy spoons to target pike. Channel Catfish are caught in these fast areas (see illustration) during May, when migrating for spawning and at night all summer. Dams prevent the species from inhabiting areas above Elkader. to congregate in faster waters. In spring, look for a sauger and walleye run the first part of March to April. Iften associated with a bump in river flow and water temperature. The changing river flow triggers them to leave their wintering holes. Fish deep resting holes and pools one to two miles downriver, where the dam forces fish to find habitat. Holes downriver will hold nice- sized walleyes, smallmouth and channel cats. Areas with a variety of depths create overhead cover and mixed river velocities with calm and current areas and a mix of bottom substrates to hold the most gamefish.